I'm a newbie and I was just wondering if anyone could give me some advice. My pond is currently thriving with large numbers of ten-pound plus largemouth and you can catch a 10 inch bluegill on every cast. I seem to have discovered a potential problem, however. 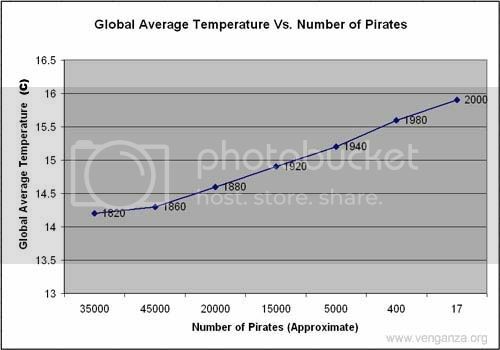 I've been researching global warming and I've noticed a definitive inverse relationship between the global average temperature and the number of pirates found worldwide. Please review the following chart I've created. Anyway, I just thought that trends such as these reveal a need for me to be proactive in my pond management goals. 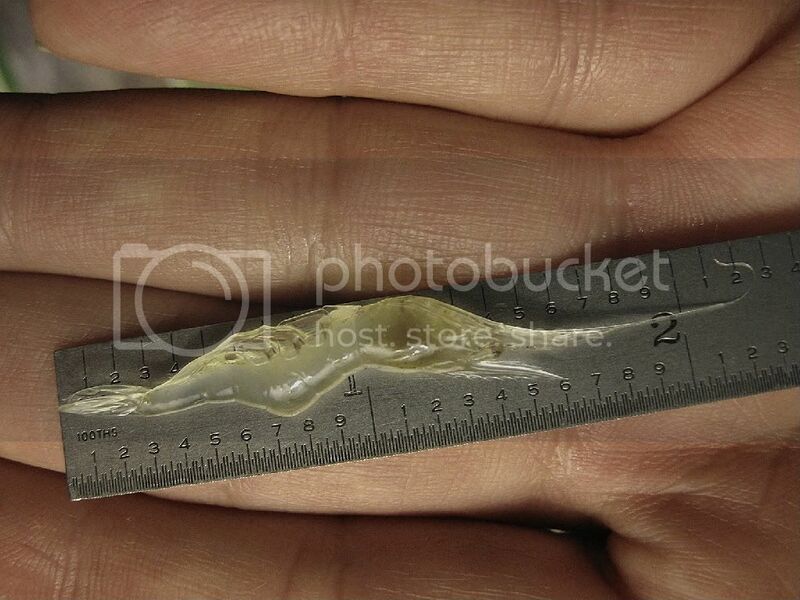 If indeed global warming is having such profound effects on planet Earth should I consider liming my pond? Or possibly stocking hybrid bluegill? Any comments would be appreciated. While my assistant's question remains pertinant, his failure to have his work reviewed by the Grad Committee at the Gallus Institute for Higher Hilarity is revealed by the switched numbers of pirates for the years 1820 and 1860. I would also like to avoid any confusing by pointing out that he is referring to High Seas, "Rrr!!" pirates in this analysis. Similar research has shown that software pirates did not begin to flourish until the effects of Global Warming were beginning to become noticeable and that their numbers have a direct-square realationship to the average mean increase in global temperature. All in all, though, a commendable effort worthy of Bruce's BS (Bulls***), MS (More of the Same), and PHD (Piled Higher and Deeper) degrees. Bruce, as you've no doubt noticed by now, you need progressively more and more gas just to reach the same high as you did the previous day. Lay off the gas, Man! Just lay off the gas. Bruce, you're coming along nicely in the BS Department but need more intense study to hang around with Theo. 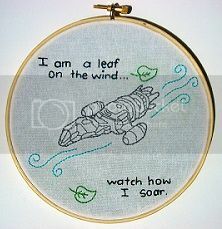 Bruce, I gotta know...are you a member/supporter/worshipper of the Flying Spaghetti Monster??? I don't want to get into a religous/political feud on this subject. You just took and used the pirate graph, which is definitely ingenious and funny The website however has me a little disturbed, although it does shed a unique perspective on the subject. I'll leave it at that. For those who have no idea what I am talking about (Flying Spaghetti Monster) click here . P.S. What if a pirate hatchery was made and bred pirate by the thousands? Would this reverse the negative affects of global warming? Actually, Cecil was having problems with photobucket so I decided to try and post a new image to photobucket to test the system. The graph was the last thing I had seen, so I needed a plausible (NOT) context in which to post it. It seemed funny at the time. Bruce - to do a true statistical analysis, you cannot use averages on your Y-axis. We're supposed to use the empirical (raw) data. Sorry; couldn't resist. I don't think this is the time to lime. It's possible you could offset the ballance of the Supreme Court! I would definetly wait until the turn of the last century, or perhaps the return of the present past. Grrrrr mate'y it is as it was before! "If you reverse the current on a 220 V. Gast aerator you will find that within half an hour you will be projected 30 minutes into the future". This seemed related to the pirate problems that I'm anticipating. This is all too "Theo"retical for me, so I am staying out of it for now. I'm not anywhere near the same league as you guys. I'm still trying to figure out how the amount of rainfall affects the water level in my pond. I haven't graduated to the level of figuring how Pirates of the Carribean affect my need for lime but you have educated me that there is a connection. Glad I watch this forum. It's really simple, BZ. The local density of the Pirates of the Carribean is directly proportional to the Johnny Deppth of your pond. Aye!, Ye be right, Sunil. AAArrgGGggHHhhh. Thanks for the timely topic,September 19th was "Talk Like A Pirate Day". Here is a link to find out your pirate name for anyone interested. Chip AKA "Bloody Tom Vane"
Thanks for the timely topic,September 19th was "Talk Like A Pirate Day". Darn, missed it again this year. Maybe it's best t's not widely known. Eye patches and wooden legs covering the store shelves would get boring. Mad Sam Cash here according to the survey. I'm "Bloody Sam Kidd," I guess that makes Bruce my pirate kin. Bloody William Kidd ya lubbers. Do that mean me kin to Black Jack Kidd and Bloody Sam Kidd . ArrrGggHhhh and ArrrGggHhhh again. It must mean me has bad blood ( genetics). You guys have been over fertilized. ArrrGgggHhhh -- no way we could be triplets.